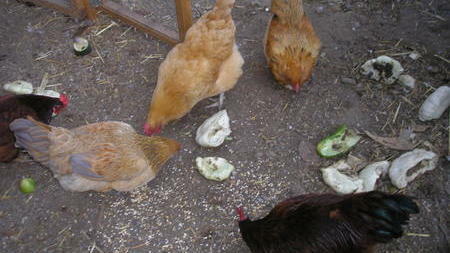 The chickens, eating yet another batch of pattypan squash. As with every good thing, our summer garden is coming to an end. The cornstalks are so dried out and decrepit that they’re starting to lean over. The pattypan leaves are mildewing, and even though the plants still produce squashes like crazy, we’re totally sick of eating them. We’ve given armloads to the chickens, who have obligingly eaten them, but now even they seem unexcited. It’s time to move on to the winter one-block feast! We need to get planting, so we have to decide on the menu. There’s nothing like planning a meal, oh, five or six months ahead. Talk about anticipation. First, a flurry of ideas: Homemade sauerkraut! Hot bread with freshly made butter! Maybe amaranth, because it’s such an interesting, beautiful, delicious, and prolific grain. Wedges of melting-fleshed orange squashes with some kind of topping involving our own chiles (dried from summer); piles of leafy greens, transformed into a stew. A dinner bursting with vitality and flavor. Plus, we still have a good stockpile of our own olive oil, wine, and vinegar, and of course eggs and honey. We’ve pickled our tomatoes, garlic, and trombetta zucchini and made a pseudo-pesto with our garlic, basil, and oil. Our hardier herbs are still alive, and probably will be as long as we cover them when it freezes. Ditto our lemon tree. We figure that’s part of the job of a summer garden: to make some serious contributions to winter eating. So, just as with the summer menu planting, we sat down with Team Garden for a reality check. Hard red winter wheat, the best bread variety that will grow in our area, is harvested in June or July–not great timing for a winter menu. Amaranth grows in summer and is harvested in fall. Mustard greens, which you do harvest in winter, don’t yield seeds (we had visions of whipping up our own mustard). Rats. My dream of a walnut tree is nixed because a) we’d have to plant a baby tree, and there’s no way it will yield in time for winter and b) they’re very messy trees; the hulls stain everything black. And, the BIG disappointment, no golden, hearty winter squash, because–who knew?–we should’ve planted it right alongside the summer squash. It takes that long to mature. Stay tuned for the progress of our plants (and feast).